Michigan Association of School Administrators Executive Director Chris Wigent presented the award on Wednesday, noting it’s not surprising that Swift would use the award as a way to promote public education. “It was clear from her nomination for this honor that Dr. 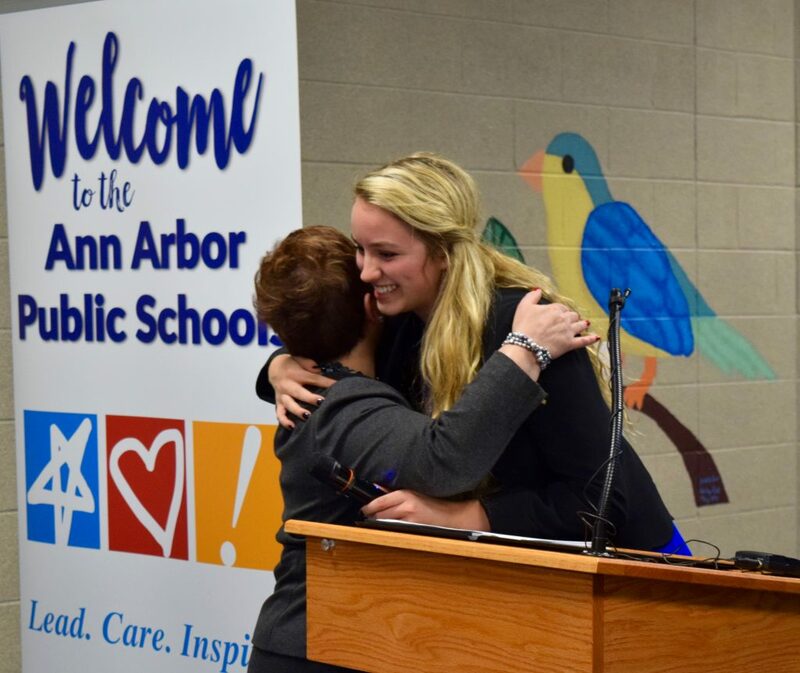 Swift is a tireless advocate for the Ann Arbor public Schools as well as for public education in our state and throughout the nation,” Wigent said. 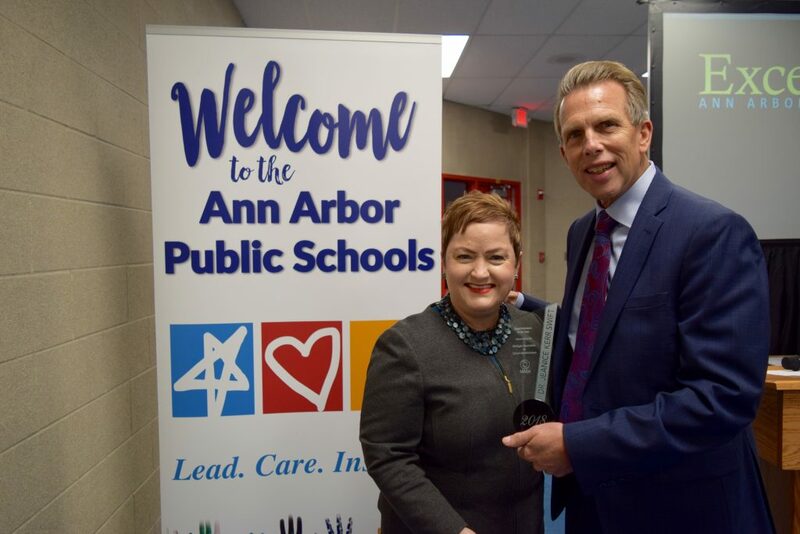 MASA Executive Director Chris Wigent presents 2018 Michigan Superintendent of the Year award to AAPS Superintendent Jeanice Swift. 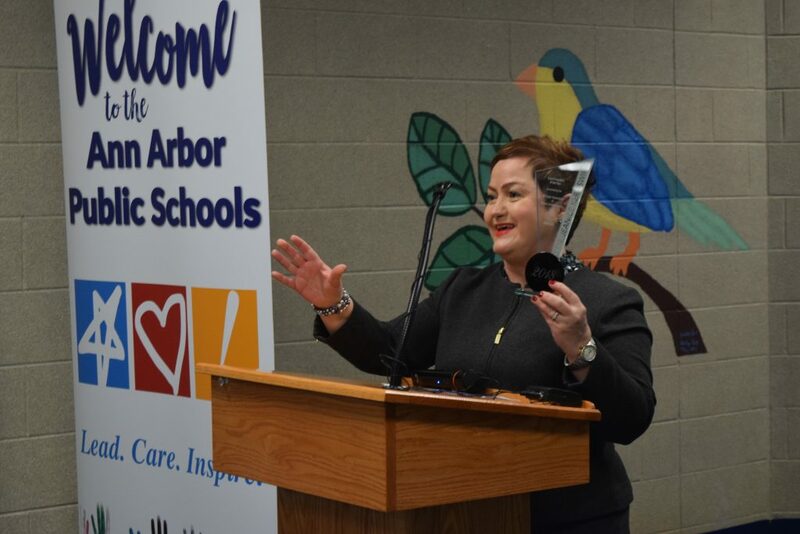 Washtenaw Intermediate School District Superintendent Scott Menzel says she laid the groundwork for this achievement right when she came to Ann Arbor. Scott Menzel said her Listen and Learn Tour was the textbook way for a superintendent to begin working in a district, but too often superintendent’s fail to take the time to listen to what a community wants. Getting feedback was a key first step, Swift however quickly acted on what she heard the community wanted from the district. Board of Education President Christine Stead highlighted that facing a decline of 200 students on top of years of budget cuts, Swift pushed for new programs to attract more students. Stead said this is a story about how much leadership matters. “As we’ve all seen our enrollment has grown, our district has gotten stronger, but more importantly she has grown leaders from within, she has inspired the confidence in our community again, and everything that’s important to everybody is starting to show progress,” Stead said. Dicken Elementary Principal Michael Madison agreed. He highlighted the reinvention of Northside Elementary as A2 STEAM, the creation of a pre-K through 12 International Baccalaureate program, re-opening in-district transfers to bring back students that had chosen to go outside the district, and opening seats for students from other communities as key decisions that have put the district in better financial shape. Madison said the outcome is AAPS is once more the premier district in Michigan. “We are great again because of Dr. Swift and for awhile we weren’t great. I remember the days that Ann Arbor was the greatest school in the state and then we fell off the pedestal but we’re back there again,” he said. Skyline Senior Olivianah Baugh thanks Superintendent Jeanice Swift for bringing Project Lead the Way to AAPS. While the many speakers praised Swift for improvements in the Ann Arbor Public Schools, she deflected the credit to others, saying that leadership is not a solo act. Swift believes AAPS success stories are thanks to parents, teachers, building leaders, and community members working together. She said she’s not really comfortable with the attention being focused on her. “I’m extremely comfortable with this being about community, that’s what it’s been about since day one, we can accomplish amazing things working ‘A2gether,” she added.